If u want a glimpse of a real village life, (not pseudo huts by leading hospitality chains), if human warmth impresses u more than professional white glove service, if u love to eat good simple local food made from fresh ingredients, make sure u do not miss this. I always rate all the food items & then give a final overall rating which is a simple average of the individual item ratings. What the ratings stand for: 5 = Excellent, 4 = Very Good, 3 = Good, 2 = Fair, 1 = Disaster. 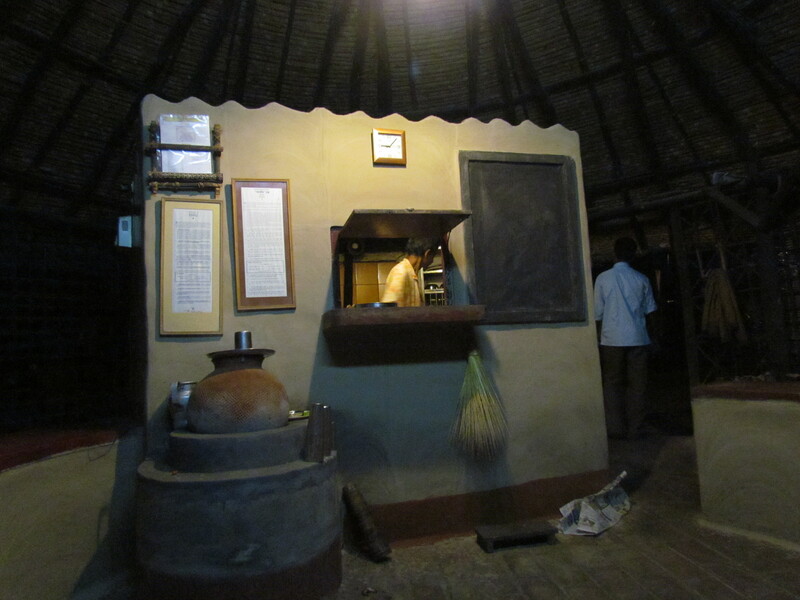 This post is not just about an eatery but also the full experience & the story around it. I am wondering where to start this post. This is one of those experiences that humbled me & unlike all other reviews where I rate the experience on a scale of 5, I will not be rating anything here. This experience, specially the food part, is beyond rating. 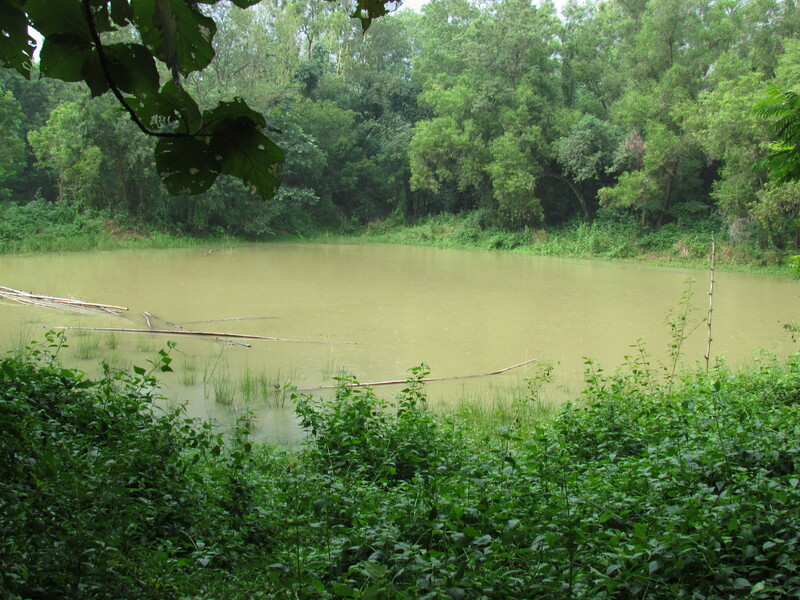 ‘BASA’ or “Babli Shanti Alay” is the name of the residential part of a village called Babli. Well, there was no village by this name decades back – it was a barren, non-productive patch of land that as a result of a combination of indiscriminate tree felling, overgrazing and neglect. 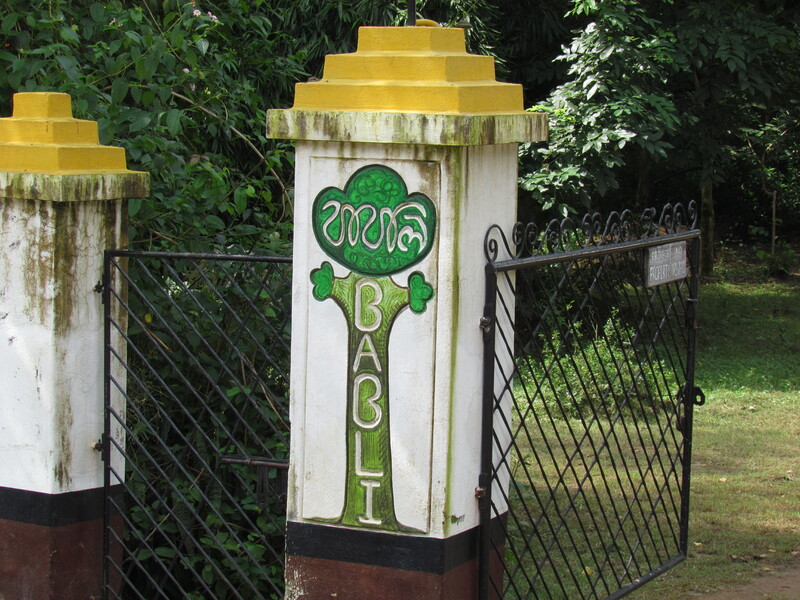 A city bred couple from Kolkata set up this village in memory of a dear one nicknamed Babli. 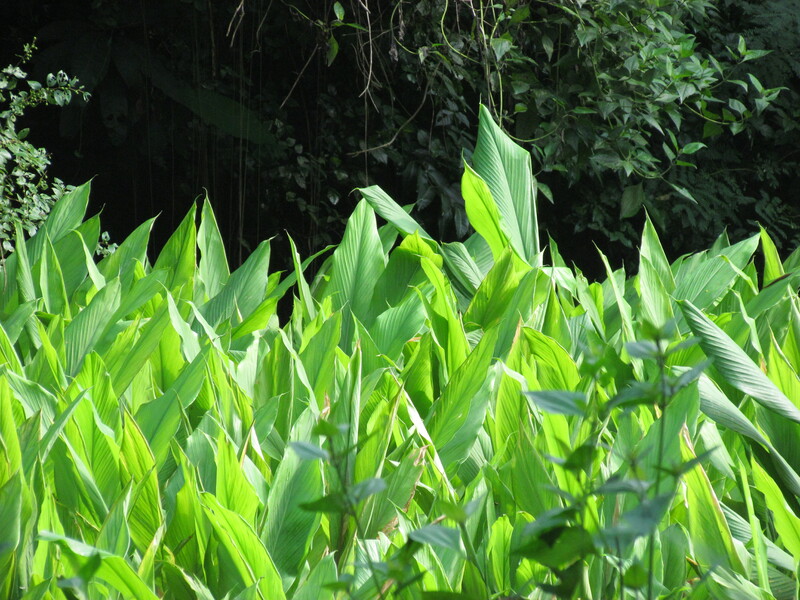 The venture was later given a full name – Bureau for Agro – Based / Linked Industries. The Babli website says that as of today Babli also stands for Belief, transformed to Action, Bolstered by Love & Inspiration. 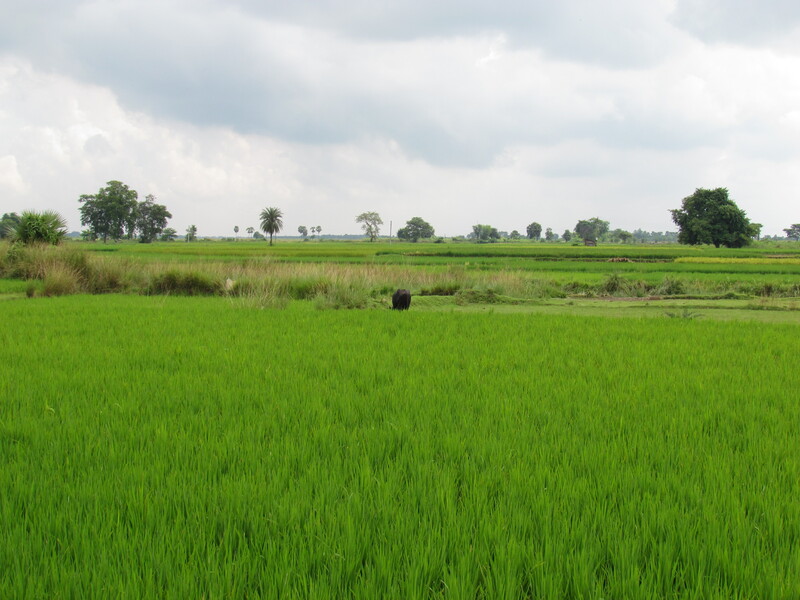 The couple tried to convert this non productive land into a productive ecosystem so that people in the area can achieve self-sufficiency. The long-term aim was to help the local land-less farmers to upgrade their skills to gain social and economic self-reliance. 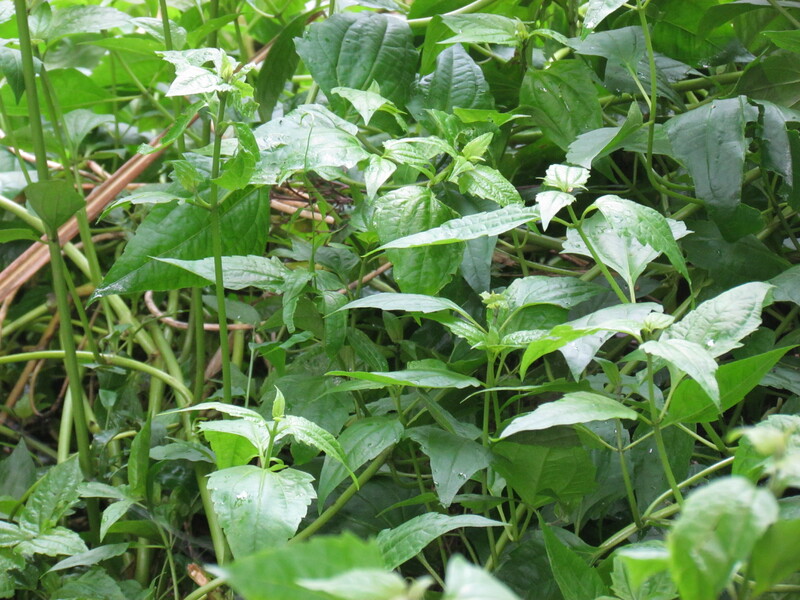 Today the village is self reliant with its own production of organically grown vegetables, seasonal fruit, country eggs, fresh-water fish, goat ‘khasi’ meat, rice, and fresh milk. 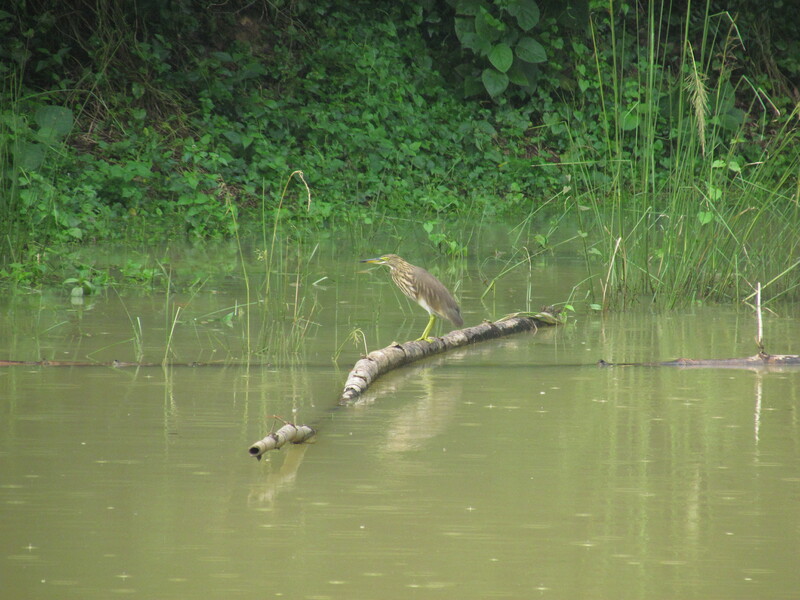 Apart from the plantations & the fields, the village has ponds & also sheds for cows, goats, ducks and chicken. 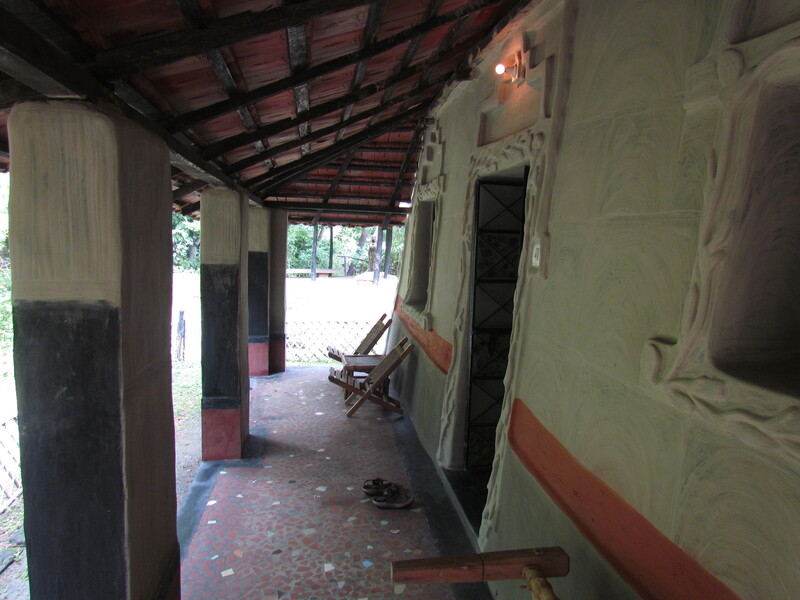 ‘BASA (Babli Shanti Aalaya) is NOT intended to be a typical Tourist Resort or Lodge. It is offered as an experiment in living in a natural and rural ambience. 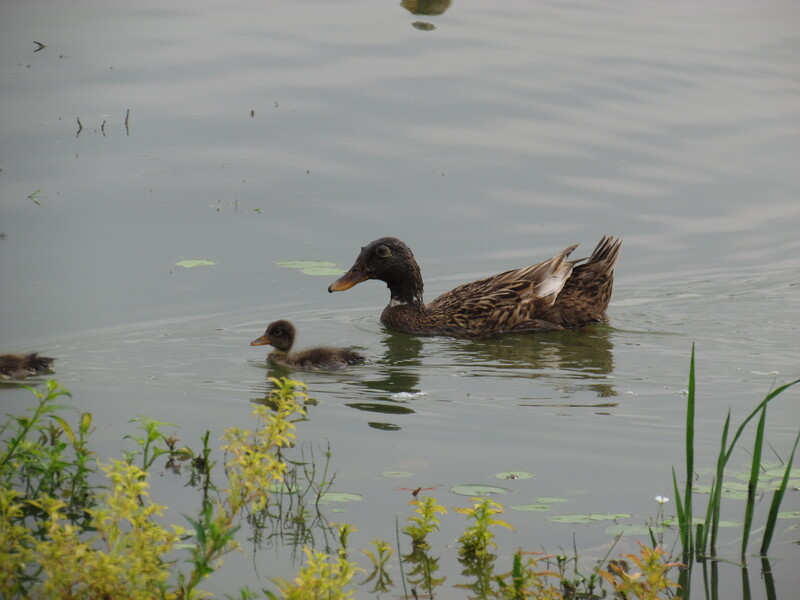 So, please do not expect urban luxury!’ states the website. Interesting? Well, Yes. ‘This is not a resort’ – At every interaction with the Management, be it thru the website, or by talking to the owners, this message comes thru consistently & multiple times with reinforcements. I have heard people finding this a bit over the top. But I inferred this as a visible intend to ‘set the expectations right’ & ‘ensure that u understand the rules of the game’ b4 u book a room here. 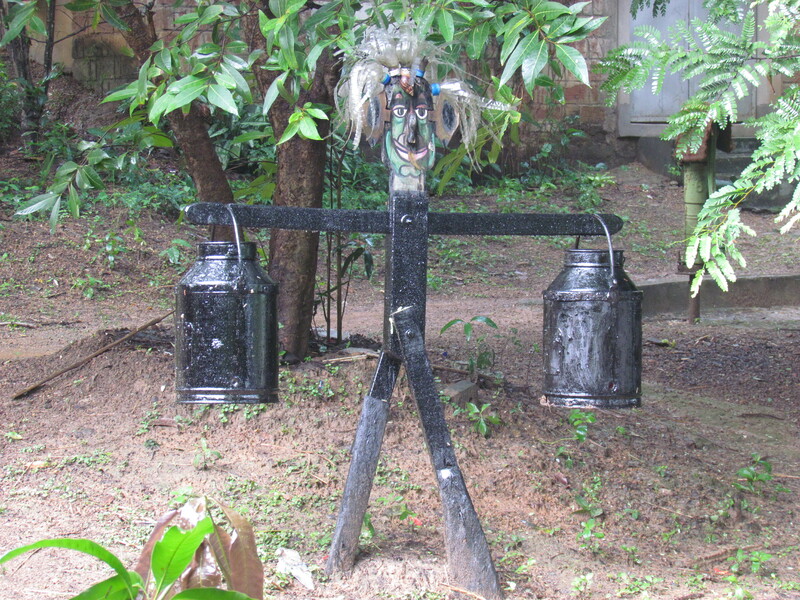 scarecrows in the campus – All of them have buckets in the hand. The website insists that u read the detailed description of the room & see the pics b4 u book. All this points to the fact that ‘if u finally choose to b here inspite of all the long list of do s & don’t s, u r most likely going to love it. The communication from the Management cud not b more transparent. I was pleasantly surprised when we were given descriptions on ‘how to get there’, followed up by two more calls. Infact I can imagine a lot of people getting irritated at the fact that the rules of the game r reinforced so hard. Personally I think that is the best thing to do to avoid conflicts later. Spot booking is not allowed. One has to compulsorily book in advance & pay full amount in advance as well. Hot bath-water is available in a certain time only (no geysers). ‘This service may be availed of outside the stipulated period, against charges, provided we have the resources available at the given time’ says the website. Car pick-up from the station is usually organized. It is OBLIGATORY to have AT LEAST ONE MAJOR MEAL (lunch/ dinner) at the CANTEEN everyday. 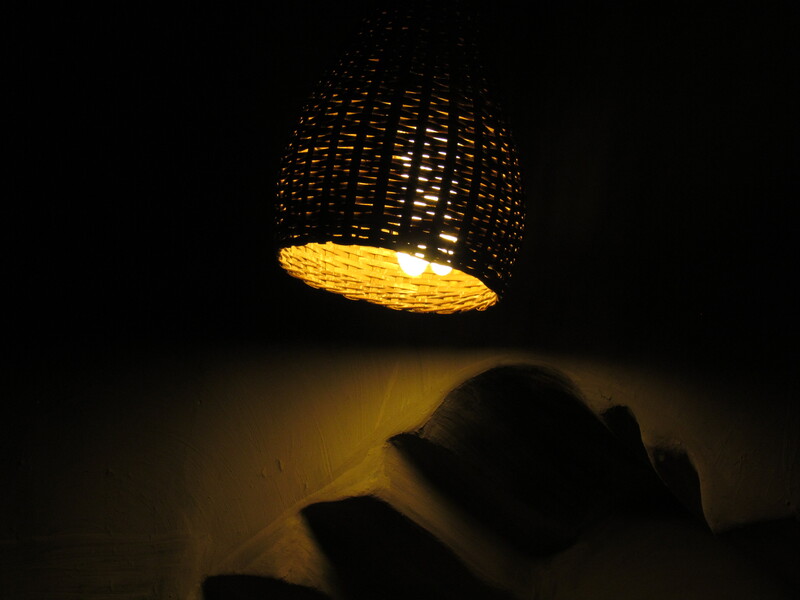 ‘As we have already mentioned, BABLI is an enterprise which attempts to function in harmony with the rural life and pastoral surroundings of the local people. “Partying” out in open areas of the project invariably entails a substantial amount of noise, which disturbs not only the peace and quiet, but more importantly, the ethos of rural life. 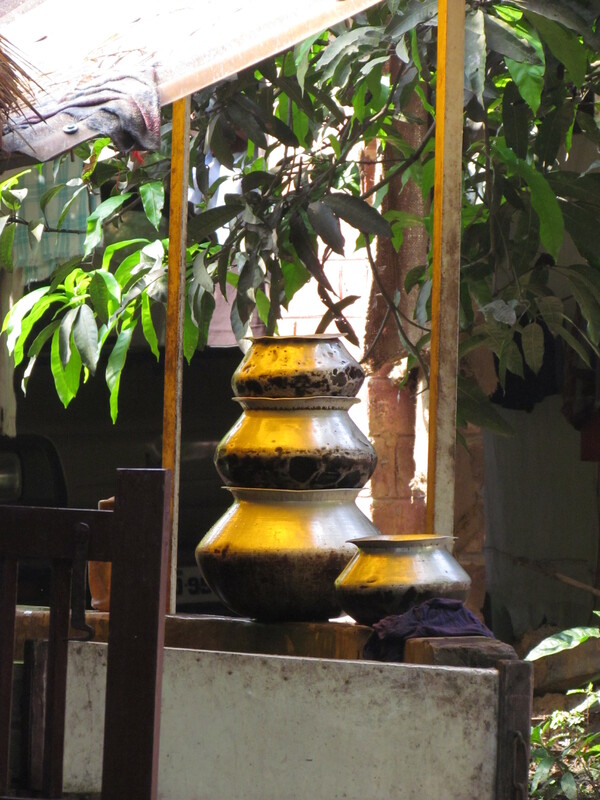 Santaals, Bauls and other exclusive communities of this area had a philosophically rich and aesthetically unique lifestyle, till city-culture barged into their social spaces. Requesting such local communities to come and “stage their show”, even when made with the best of intensions, tantamount to subjugating them to the status of performing-monkeys! I personally do not agree to the ‘monkey’ logic coz performers of all kinds always dance t the audience. When we reached BASA in a car from Kolkata (180 km one side), we were not sure that the car can be parked inside the campus of BASA. Though it looked small for an MUV, there were few car parks inside. 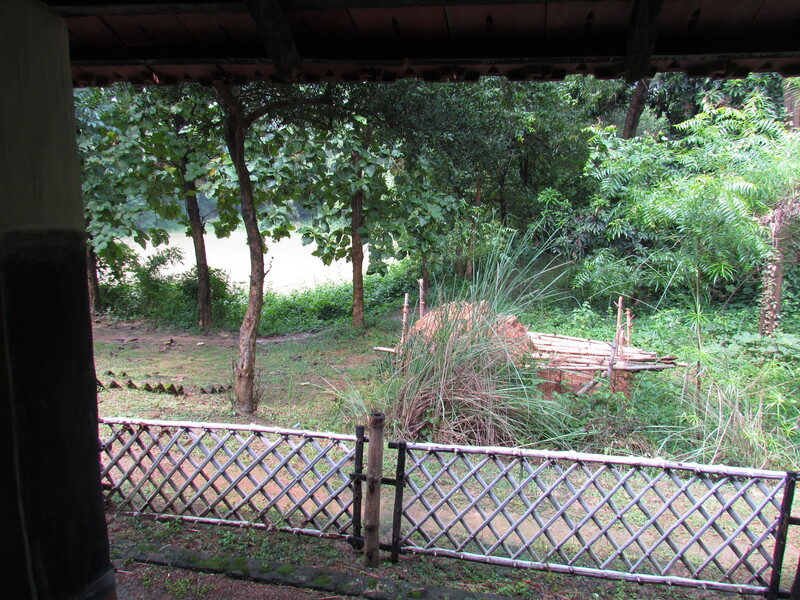 Right at the entrance was the canteen, behind it was the Office & almost everywhere else there were trees & trees. As we ‘checked in’, we were escorted to our room. 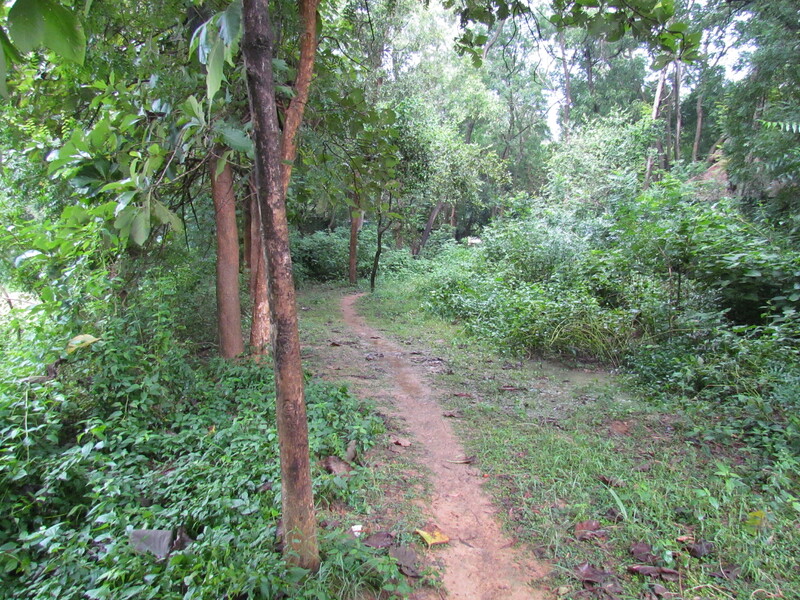 There was no proper road but a narrow forest path to get to the mud house that we had booked. 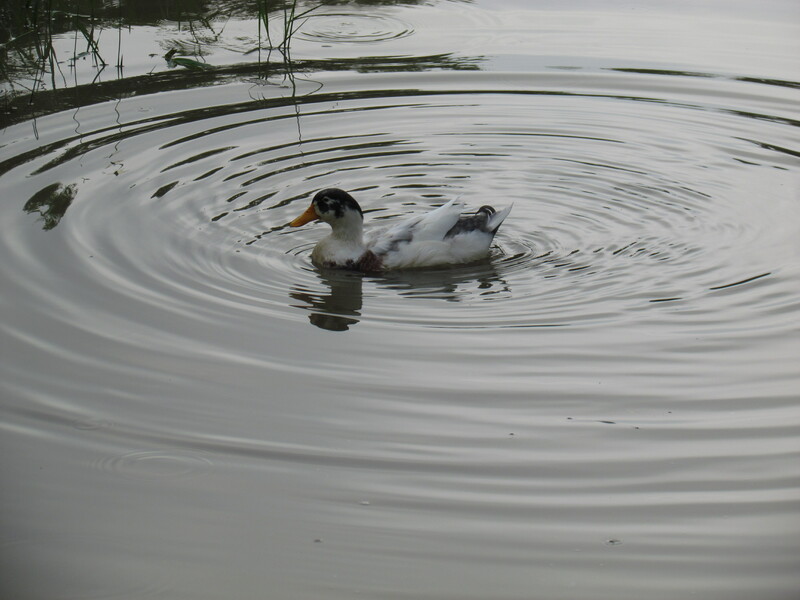 There was a small pond on one side which was full of ripples from mild rain drops. 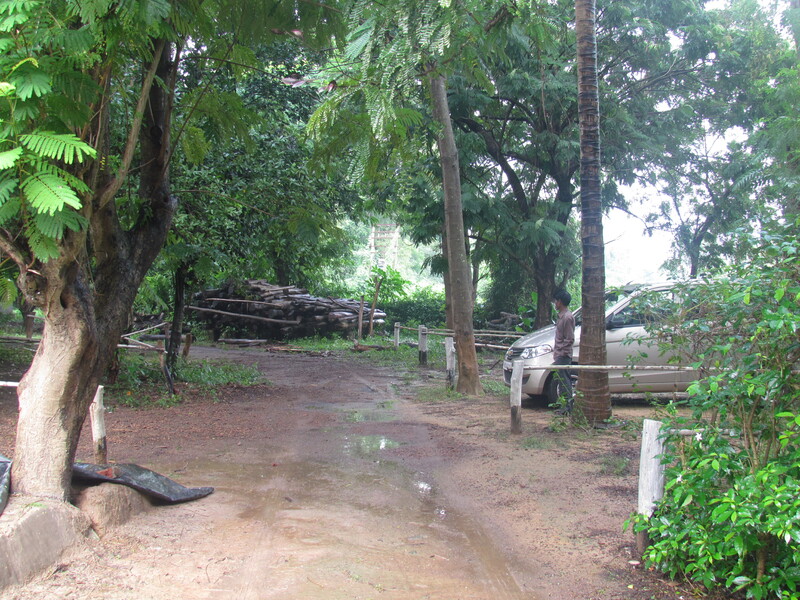 On the way to the mud house we saw few scare crows here & there. Pretty innovative I must say. 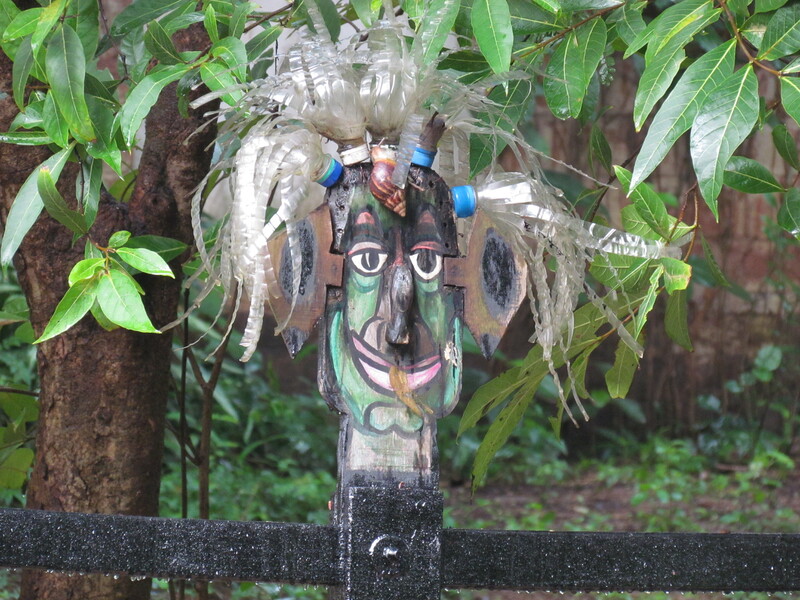 scarecrow made with metal – hair made with plastic bottles!!!! 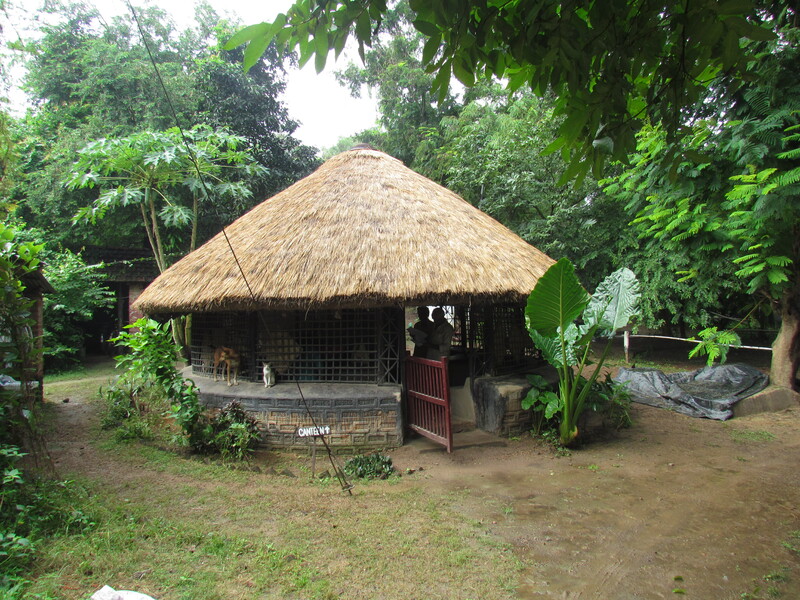 The mud house was quite big. 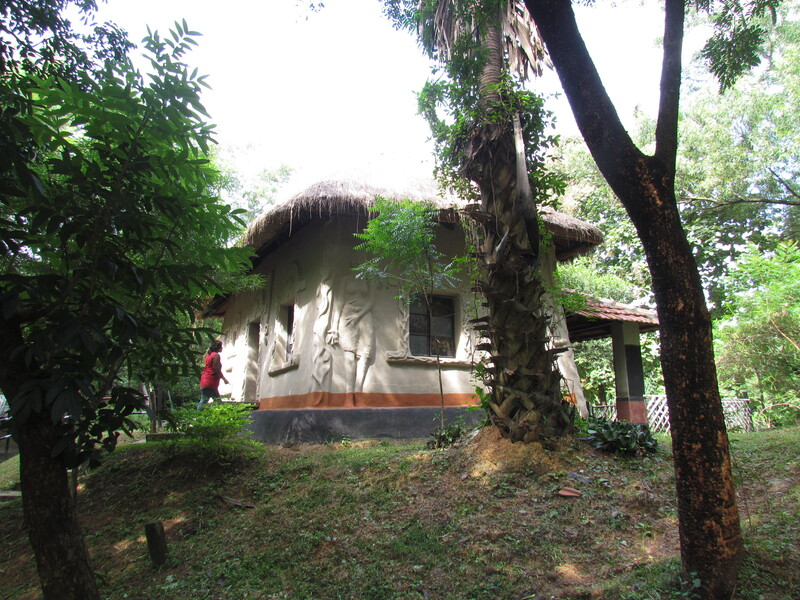 It had super thick walls & grass roof. 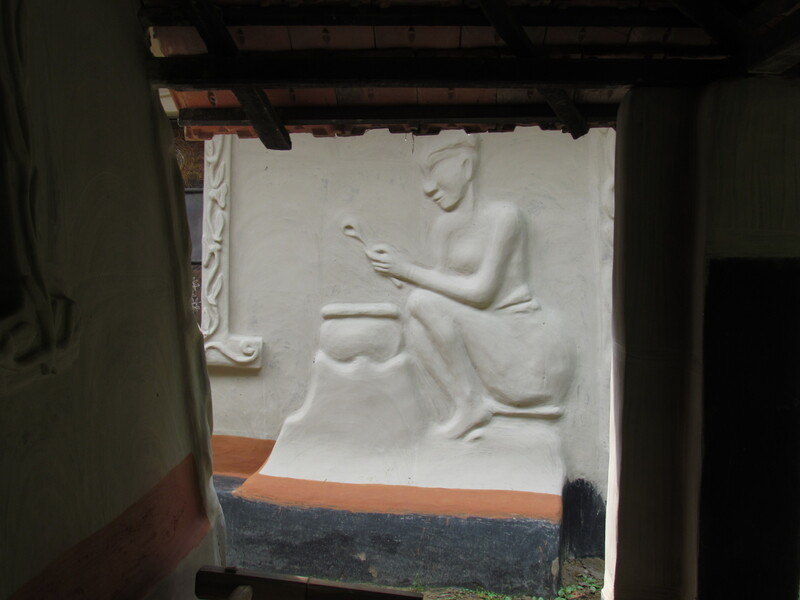 There were frescos on the wall of the mudhouse. In the balcony of the mudhouse was a khatia & few easy chairs. 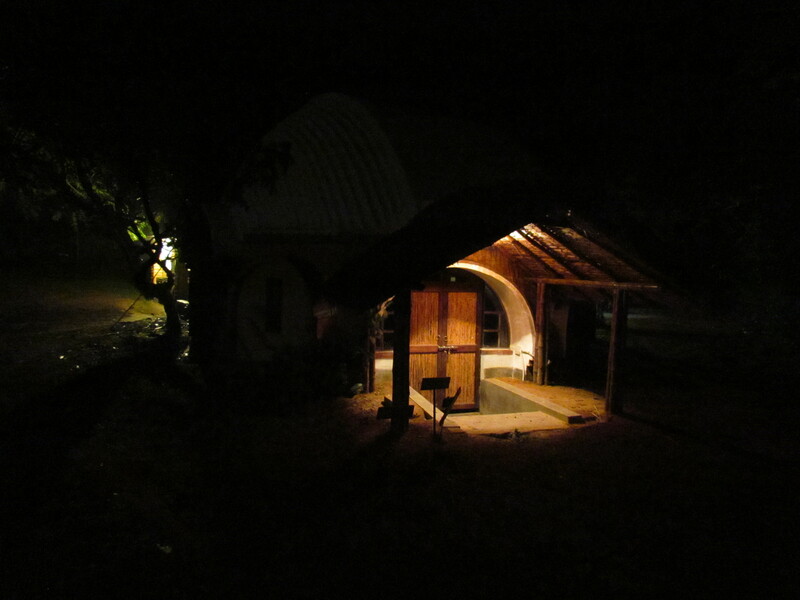 Inside the hut there was a bedroom , a modern toilet & a mezzanine area with another bed. Traditional cloth Gamcha was used to make curtains. 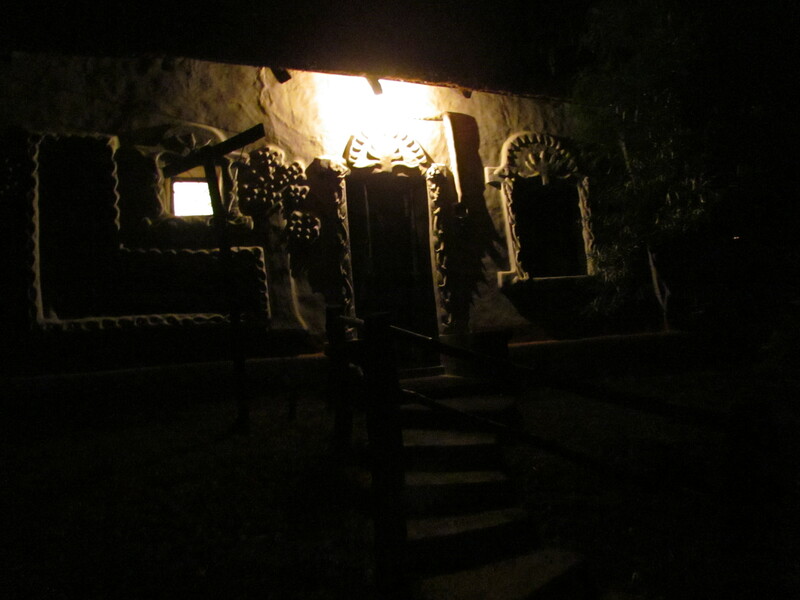 Needless to say the hut had no airconditioners & believe me, it did not need as well. 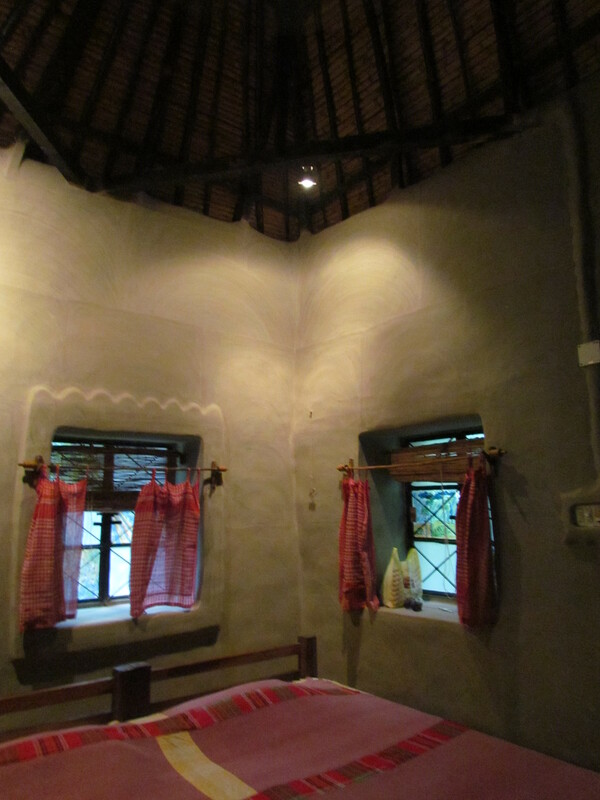 The thick mud walls cooled the room well. While we were using AC in Kolkata the day before, just a fan was good enough here. 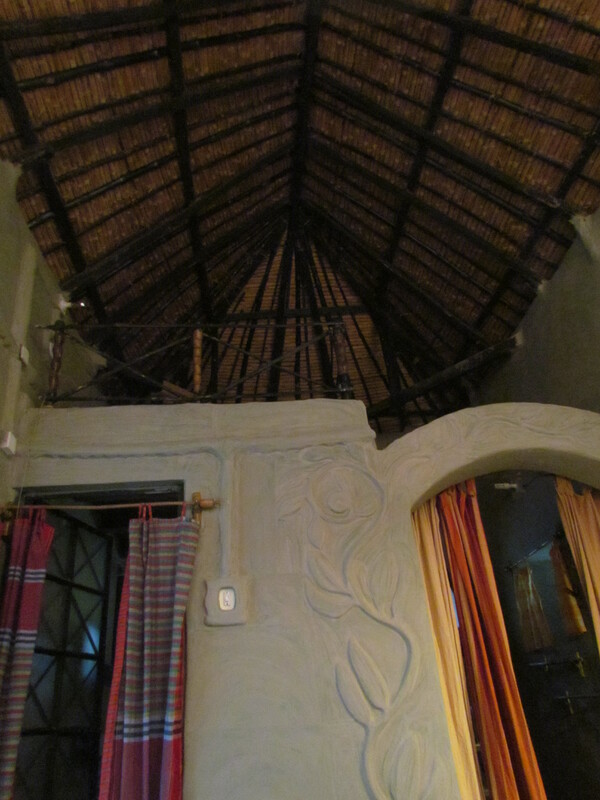 the mezzanine floor with a double bed, high ceiling made on bamboo frame & with dried grass, fresco on the wall. 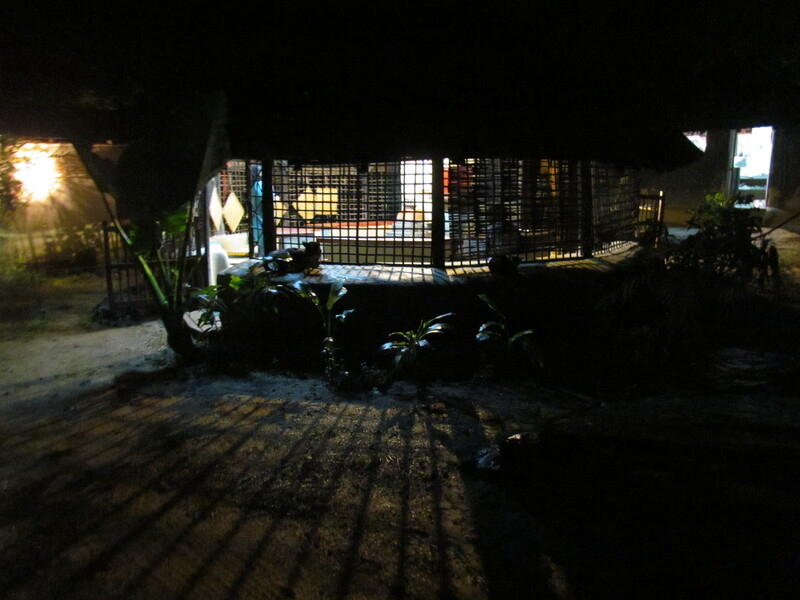 When we got out of the room in the evening to go to the canteen we realized that it was pitch dark outside, with just sound of insects. Suddenly we saw a pair of glowing eyes in the dark, to soon realize that it was a dog. In the morning we went for a walk in the campus & enjoyed walking thru the plantation, the cattle shed , the ponds & the agricultural fields. All the while chirping birds gave us non stop audio entertainment. The canteen served simple Bengali fare, along with fragrant, home-grown rice and Ghee. B4 going, we had read on the website – ‘Our Canteen is a part of BABLI’s action programme and it is an enterprise by locals. 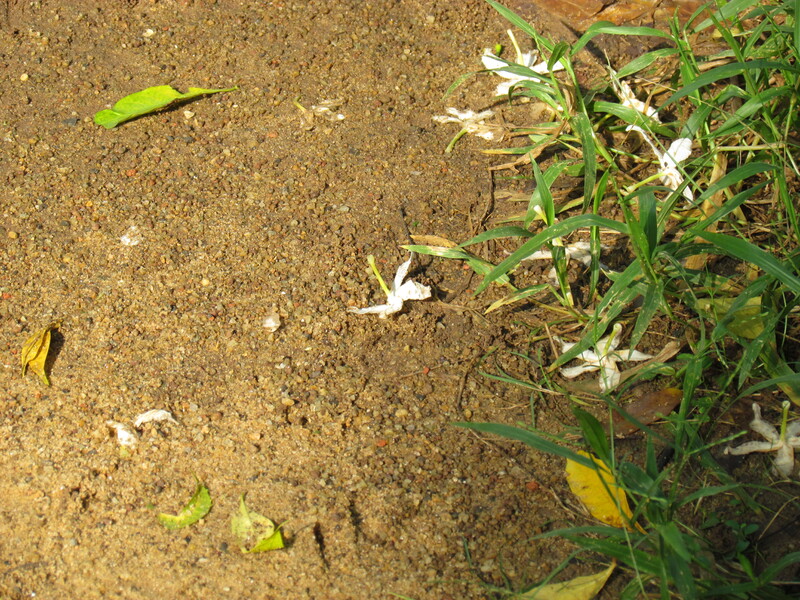 Shohodeb Gupta is the primary “entrepreneur”. 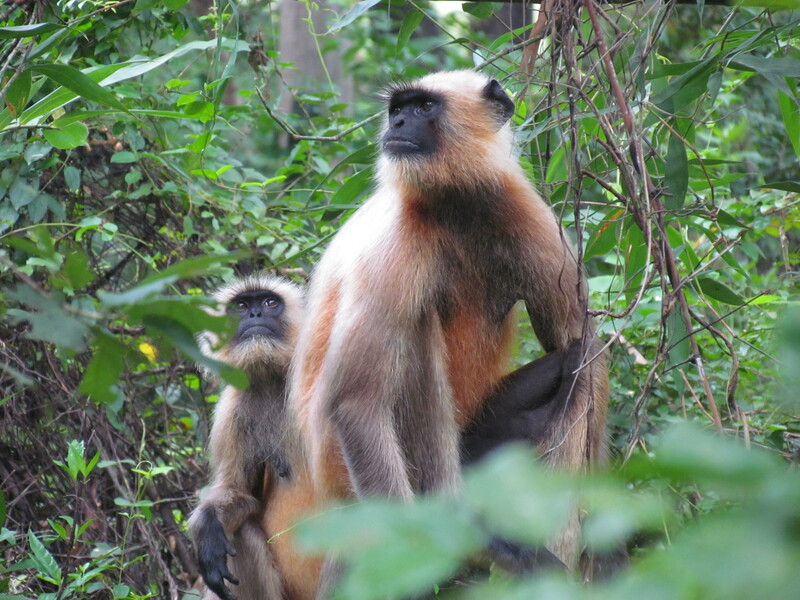 BABLI management supervises and guides the team. BABLI staff also use the same canteen. Room service for meals in special cases only & 25% extra charge is applicable on the same. 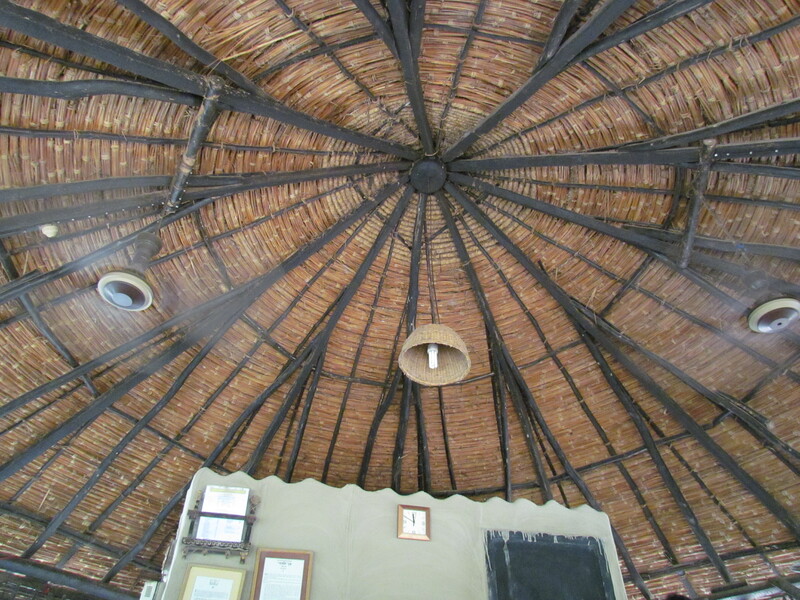 The canteen is a round open hut with thatched roof. By ‘open’ I mean there is a wall structure made with bamboo that holds the roof. 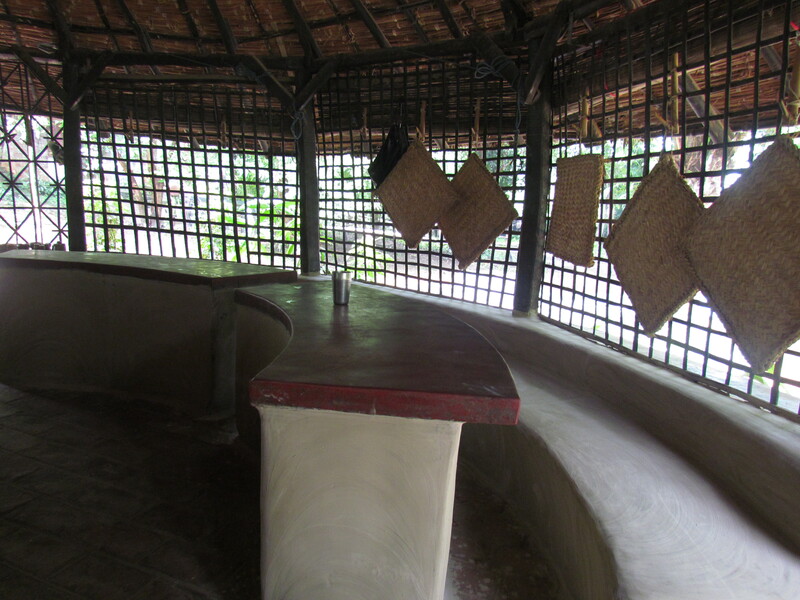 The seats r made with mud & so is the fixed table. Roughly 15 people can eat here at a time. There is a kitchen room attached. It has a small window counter thru which one cud see Shohodeb da inside. The canteen story of course cannot start without talking about Shohodeb da. An aged but active person from an adjoining village who has been with this project since inception. I always saw him in his lungi & vest. He was such a nice, humble & simple person & he was ‘what a cook’. We spent, I guess, few hours (cumulatively) chatting with him about the village, the farm, shantiniketan & loads of other topics. Loved the conversation. He wud cook, talk, serve us the food & also sit by us. He is what makes the canteen different from any other eatery. He is the reason why I am unable to rate the food. His warmth made us feel at home & YUMMRAJ surely does not rate home food. The food he wud cook was simple but consistently outstanding. Shukto with raw pumpkin (not fully ripe) & scraped coconut, ucchey (a variant of bitter gourd) and nothing else. Cooked with mustard oil this curry had an inherent pungency. Balance of salt sweet bitter was optimum. Takes massive calibre to make it that way. 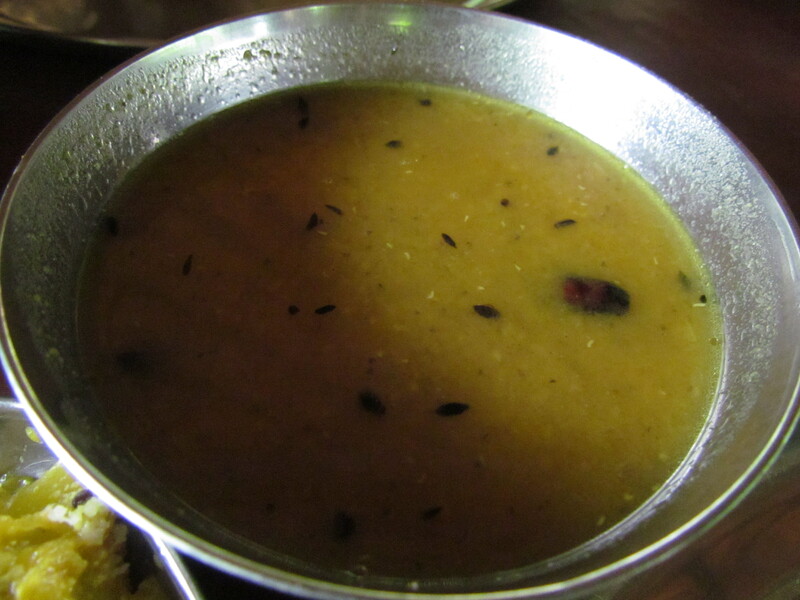 Dal and potol bhaja were very good – Just like home. We had some pakoras, bread & omelets that were also home like. 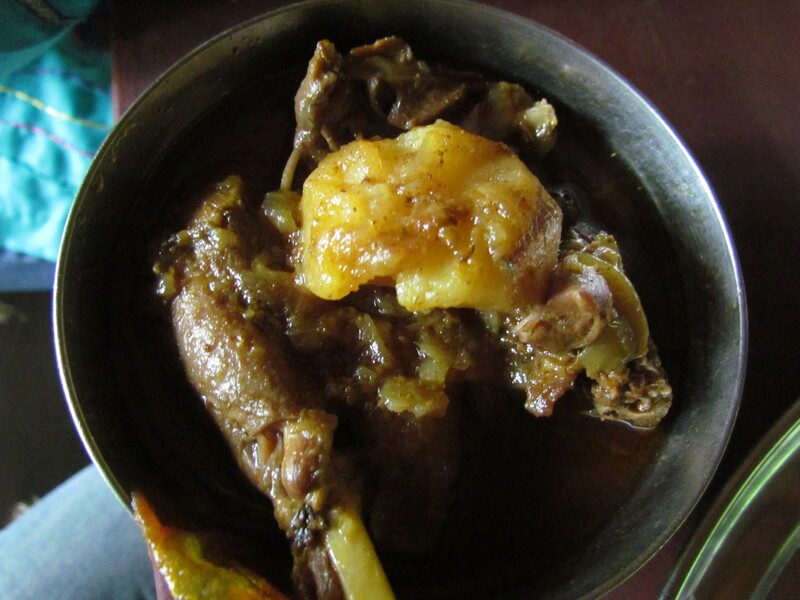 Desi chicken (from the farm) was made with mustard oil. It was finger licking good. Just Outstanding. 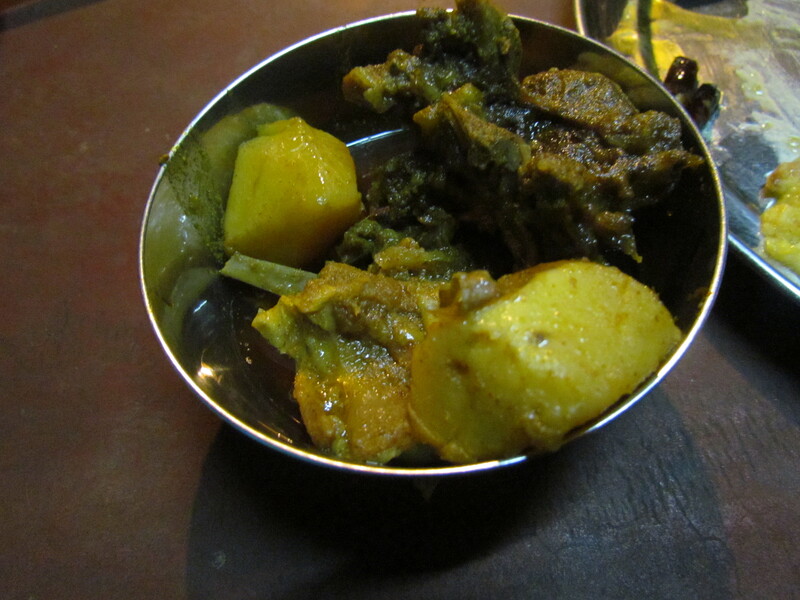 He also cooked kochi paantha (small goat) curry for us. Drooling good. Super soft melt in the mouth meat & excellent gravy. 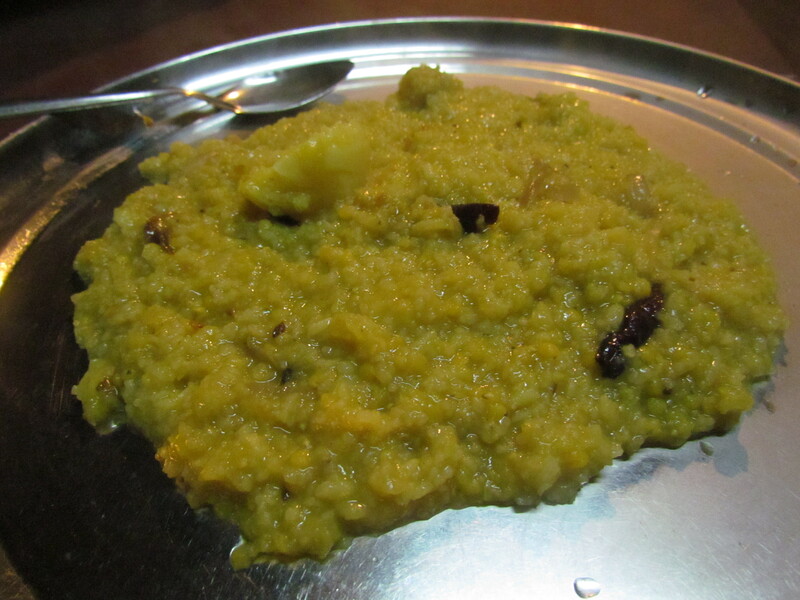 Liked eating the khichuri with different accompaniments. A generous helping of farm made aromatic cow ghee enhanced the experience manifold. 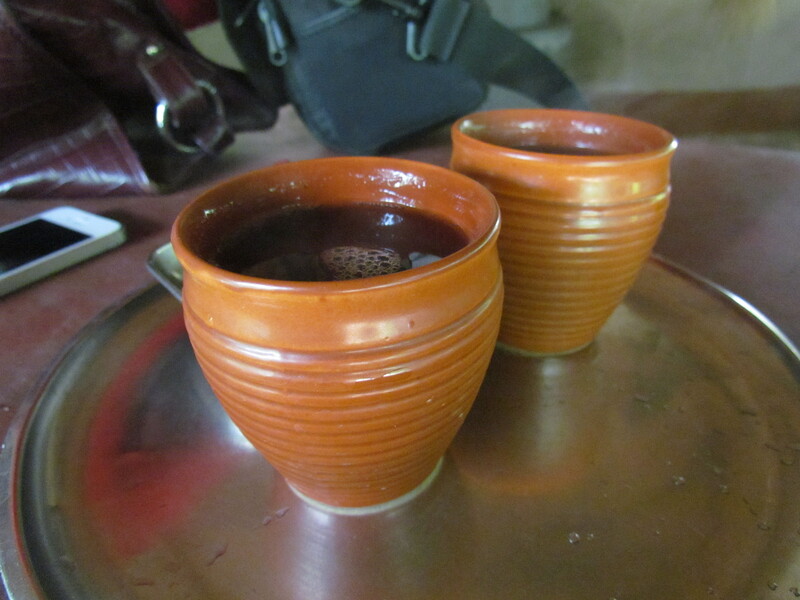 We also had Bhat-e-Bhat. 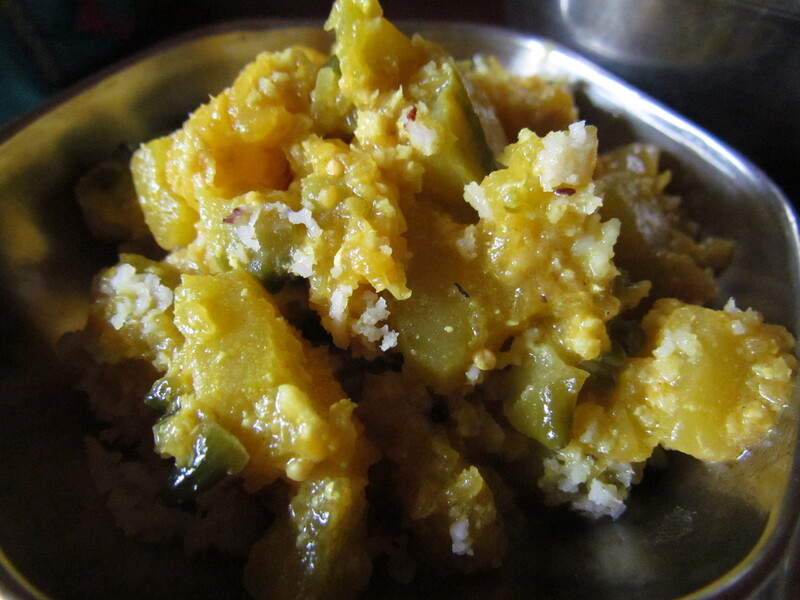 It was Gobindobhog Rice cooked with mixed vegetables, served with Ghee, Dal-Sheddho (boiled lentil) & (Boiled) Egg Makha. Excessively simple but very good to taste. I overate as if there was no tomorrow. Home-made paneer curry was lovely as well. Super soft paneer fried in hot il led the charred ends but soft inside. We missed Shohodeb’s Special, a traditional Birbhum meal — Saag (seasonal, local), Bhat, Biuli’r Dal, aloo-Posto, Macher-Tok (fish in sour gravy) etc. Will keep it for next time. We also got to know that Shohodeb da also makes kababs & cooks few Chines dishes & Burmese Khowswey. 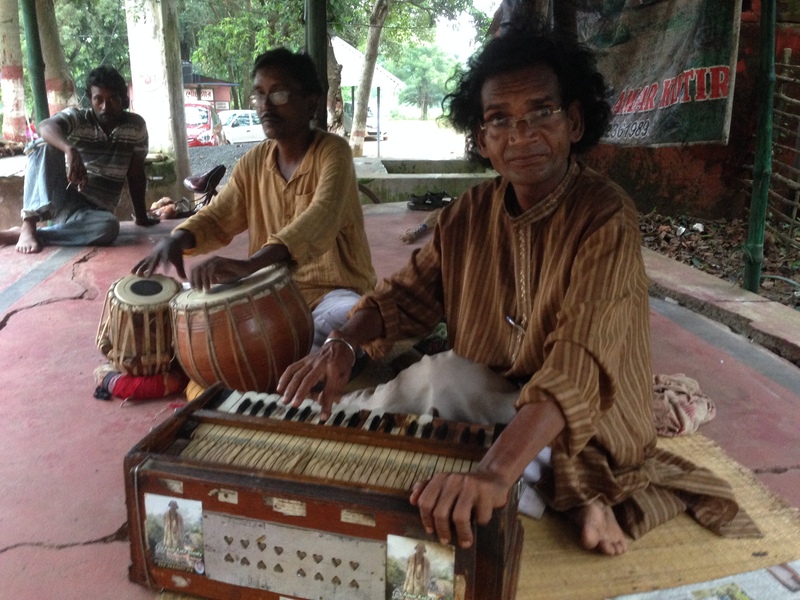 When we asked him how he learnt it, he said with a smile ‘Madam (owner) has taught me’. While leaving after a night’s stay it felt like we were there for quite some days & we were saying goodbye to a long known relative. 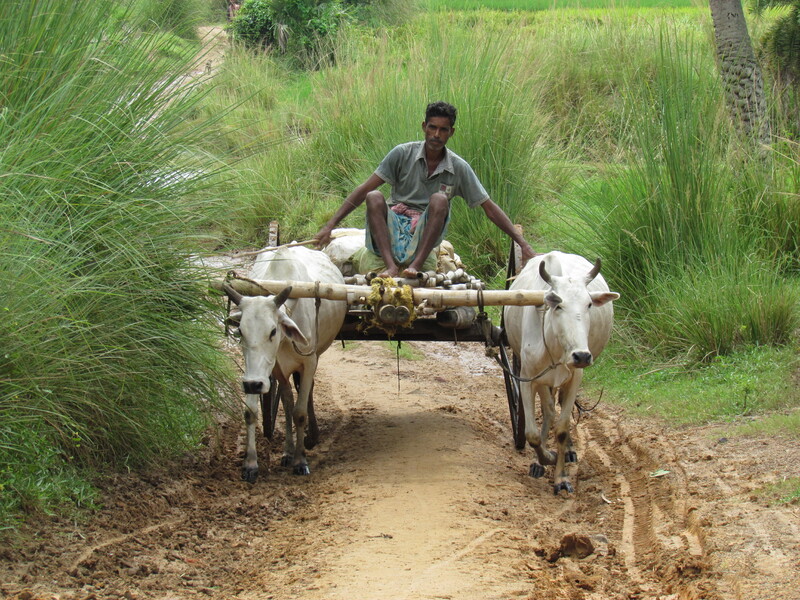 My wish, as I sit & write this now – Long Live Shohodeb da & may Babli farm keep on doing this fab job. Excellent! Got to have one near delhi for Urban devils! I am looking for the same. Not yet found one. Lovely description of a place of which I have fond recollections! Excellent post! Nice review. A lot of information and also an introduction to a unique institution. Is is open now? 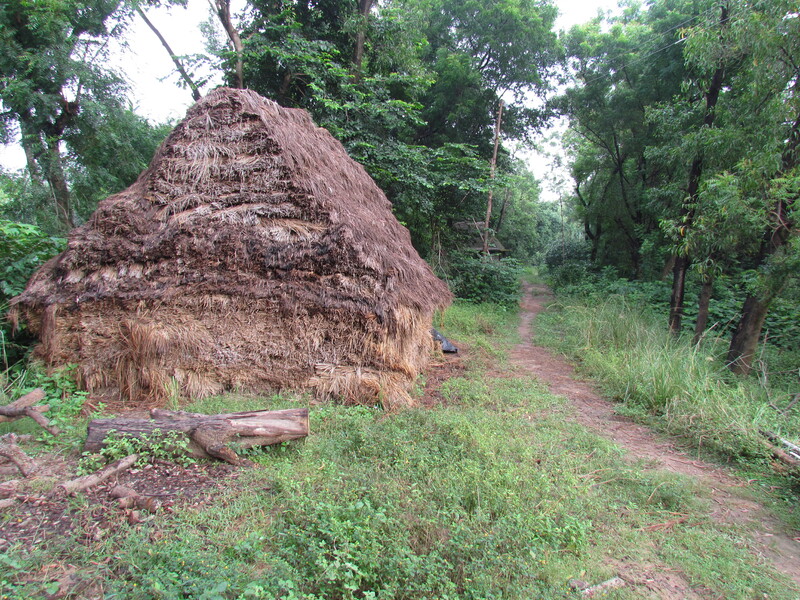 Or is couple allowed in that mud house? yes couples and family are allowed there. Pls call them to check if they are open now.